Bigfoot News | Bigfoot Lunch Club: Everyone has a Bigfoot. What’s your Bigfoot? Everyone has a Bigfoot. What’s your Bigfoot? "A story of enduring friendship and epic dreams"
"A truly heart-warming slice of Americana like no other"
"Subtle, human, and touching - not at all typical." 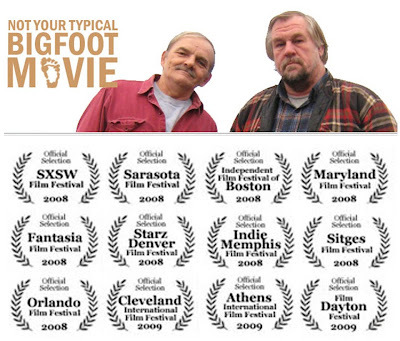 "Masterful for the dignity it infuses into the duo's lives"
Back in February 2008 we wrote a post about this little known Bigfoot Documentary that was more about Bigfooters than it was about Bigfoot. As you can see from the image and quotes above it has garnered critical acclaim and international attention. This documentary has just launched a brand new promotional website. The site and the movie is really about the pursuit. Its the pursuit we all share. "Everyone has a Bigfoot. What’s your Bigfoot?...In many ways, making a film about Bigfoot researchers is very similar to Bigfoot researchers trying to prove that Bigfoot exists. I believe we all have some kind of passion or dream, and it’s crucially important that we devote time to pursuing it. We will of course encounter obstacles, challenges, and hurdles. Sometimes those passions or dreams are ones the world might be used to, and other times they may be something more nontraditional, more outside of the norm. Regardless though, PLEASE PLEASE PLEASE, do us all a favor and pursue them. --Jay Delaney "
Check out the official Not Your Typical Bigfoot Movie website, because they provide a whole host of ways to watch the movie including Netflix on-demand. Thank you Bigfoot Lunch Club for the nice mention! Sasquatch Sighting Near Obama Vacation Home!